Champion jockey Kerrin McEvoy says being afforded a clear run in Saturday’s Golden Rose is more important than worrying about what barrier The Autumn Sun has to contend with. The exciting colt had traffic problems when he lost his unbeaten record earlier this month in the Stan Fox Stakes and that’s where McEvoy sees barrier 10 as more a blessing than a curse. He knows he can’t afford for things to go wrong as The Autumn Sun has to deal with coming back 100m on a good track against a group of three-year-olds arguably better suited to 1400m. 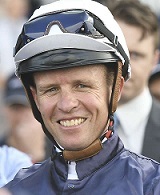 “The barrier allows us to hopefully file into a position and have an uninterrupted run,’’ McEvoy said. “He has such a big action so that’s important. Four of the last five winners of the Group 1 $1m De Bortoli Wines Golden Rose (1400m) have jumped from double figure barriers including The Autumn Sun's trainer Chris Waller's lone winner Zoustar (2013), who is the sire of his other runners Lean Mean Machine and Zousain. McEvoy, winner of the 2009 Golden Rose on Denman, said although The Autumn Sun was beaten in the Stan Fox he rates the performance as good as a win. The colt, already a Group 1 winner of the JJ Atkins, found himself back near last on the fence on the turn first-up and was never able to fully extend but still managed to run third behind Tarka. Punters Intel data shows he ran the fastest last 200m of the race in 12.40 when he was able to wind up. At $3.90 on Friday he was pressing Graff ($3.40) for Rose favouritism with TAB. “We got into all sorts of trouble there last start and were a certainty beaten,’’ he said. “Take that out of the equation, if you have him down as a winner you go in with plenty of confidence. Sharpness is something that’s also in McEvoy’s mind when he rides Youngstar in the Group 2 $200,000 Schweppes Shannon Stakes (1500m). The Queensland Oaks winner produced an eye-catching first-up sixth in the Tramway Stakes, running the fastest last 600m of the race in 32.97, and the effort earned high praise from McEvoy. “I must admit I was a little apprehensive about how she would handle the step up to open age in her first-up run but it was a stellar performance,’’ he said. Jockey Kerrin McEvoy (Pic: Bradley Photos). Youngstar was the $3.10 favourite with TAB on Friday to hand Waller his first winner in the Shannon, a rare feature race the champion trainer hasn’t yet managed to claim. McEvoy is banking on the genius of Waller to keep the four-year-old fresh enough at this stage of her campaign, aimed at staying features in Melbourne, to sprint like she did first-up. “I doubt she would have lost too much of her sharpness,’’ he said. Meanwhile, McEvoy gave Epsom Handicap second favourite Unforgotten his tick of approval after her barrier trial at Rosehill on Friday morning. And he also gave Everest champ Redzel a glowing report following Thursday morning trackwork, his first serious work since the stable mishap that saw him scratched from The Shorts last weekend. “He felt fine, he doesn’t seem to have taken any ill effects after that stiffness,’’ McEvoy said. Redzel, second favourite at $6 for The TAB Everest, runs in the Premiere Stakes (1200m) at Randwick on Satutrday week alongside Everest runners Trapeze Artist, In Her Time, Invincible Star, Santa Ana Lane and Shoals.